The perfect snack to compliment your Tetris gaming marathon! 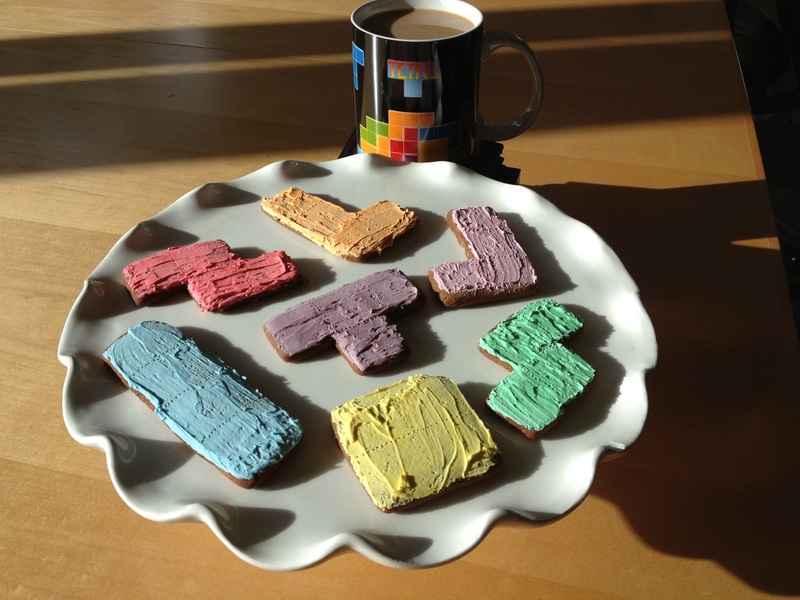 Baking a tasty batch of Tetris cookies is a great way to show your love of Tetris, and keep yourself full during a puzzle gaming marathon. If you think that your cooking skills aren’t up to snuff, rest assured that baking Tetris cookies is quite easy. First, ask yourself what kind of cookies you’d like to eat. Are you a fan of chocolate chip, or do you prefer snickerdoodle? Do you plan to share your cookies with others, or are they a personal snack? After you figure out what flavor you want your Tetris cookies to be, and get a rough idea how many you plan to bake, you’re ready to head out and buy supplies. To make things as easy as possible, purchase cookie dough or other pre-made cookie ingredients at the store. Once you get everything home, be sure to keep your supplies organized in your pantry or refrigerator so you can track things down quickly when you’re ready to bake another batch of cookies! If you’re looking for a homemade touch, you’ll need to find a recipe. Personally, I like to search online for highly rated recipes, as they often list the exact ingredients and steps required, but naturally, you should do what works best for you. You can buy Tetris cookie cutters online, though if you’re short on time, you can always use a knife to carefully (and we do mean carefully) cut the dough into Tetriminos. Pro tip: be sure to prep your cookie dough on a cutting board or other clean surface rather than your baking sheet. While shaping your dough using either Tetris cookie cutters or a knife, preheat your oven to the specified temperature. Most of the time this will be 350 degrees. After your cookie dough is cut and ready to go, you’ll need to prepare your baking sheet prior to placing the Tetriminos. Using nonstick spray or a sheet of parchment paper, coat the bottom of your baking sheet so that your cookies don’t stick to the pan and break apart when removed. Additionally, this will make it easier to clean your baking sheet once you’re done, giving you more time to savor your freshly baked cookies. 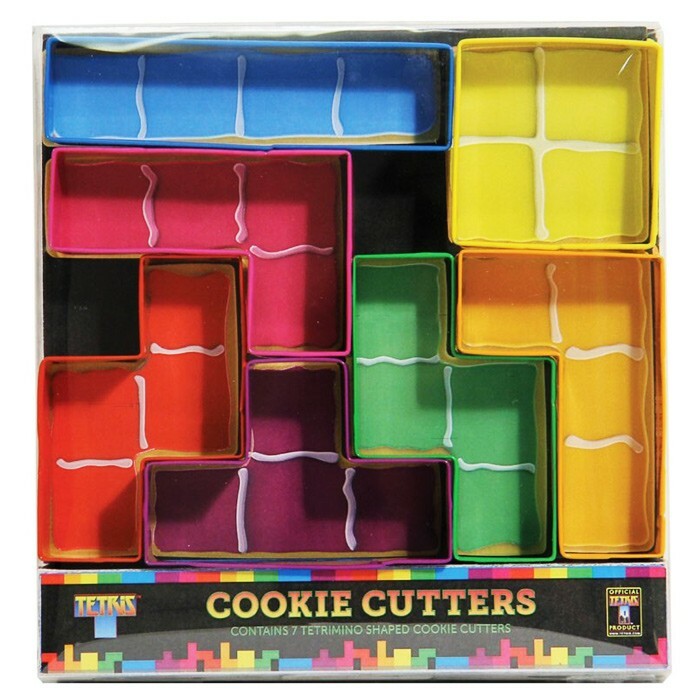 To make things easier, you can even purchase Tetris cookie cutters to help recreate your favorite Tetriminos! With your baking sheet ready, place your Tetriminos onto it. You’ll want to give the cookies at least 1-inch of space all around as the dough will expand when cooked. Think of your baking sheet like a Tetris Matrix, but make sure none of your Tetriminos touch. I know, I know! That goes against the very nature of Tetris, but when it comes to baking cookies, it’s OK to bend the rules. When all of your Tetriminos are on the baking sheet, check your oven to ensure it has finished preheating. Next, stick your baking sheet on the center rack and set a timer. The time will usually be specified along with the recipe or pre-made boxed ingredients. The average cook time is between 8-15 minutes, though it’s important to check your cookies frequently to ensure they don’t burn. To check them, we suggest having a toothpick or fork handy. Stick this into the center of one of the cookies, and if it comes out clean (not sticky) they’re done! Remember to use an oven mitt when removing your baking sheet because it’ll be extremely hot. Then, set your baking sheet on top of your stove to cool. If you have young children or pets, you may want to remain close by to make sure they don’t grab a tasty treat while it’s still burning hot! With your cookies cooked and cooled, gently remove them from your baking sheet. I like to use a spatula, though you can use whichever tool you’re most comfortable with. If you’d like to decorate your cookies with icing or sprinkles, now’s the time. Once you’re happy with how your Tetris cookies look, it’s time to grab a bite, then get back to enjoying another round of Tetris.